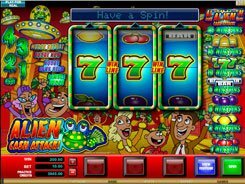 Martian Money is a space-themed video slot that follows the 3-reel layout with 5 paylines. 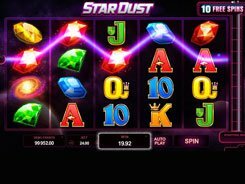 The classic slot design promises a simple and smooth gameplay, still the symbols in the slot have nothing to do with a traditional Vegas-style set. 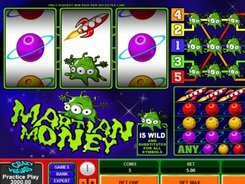 Instead of common bars and cherries used in most 3-reel games, Martian Money features planets, spaceships and green three-eyed aliens. 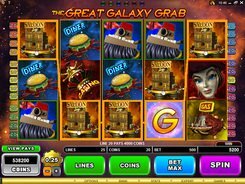 A player can bet a single coin per line and choose a coin size from $0.25 to $5, for a maximum wager of $25 per spin. 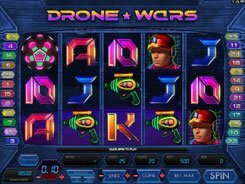 Landing three Purple, Yellow or Red Planets across a payline awards 10, 40 or 60 coins, for three of a kind. Three Spaceship symbols produce a 80-coin win. The highest paying symbol is a creepy Martian. 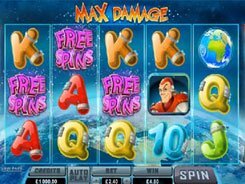 If you are looking to enjoy some very large payouts, ensure your bet is the 5-coin maximum. In this case, you can get up to $25,000 if three Martians appear across line #5. In addition, the Martian acts as a substitute for other symbols, thus helping to form winning combinations. PLAY FOR REAL MONEY!